Jonathan is a certified personal trainer through the American College of Sports Medicine (ACSM). 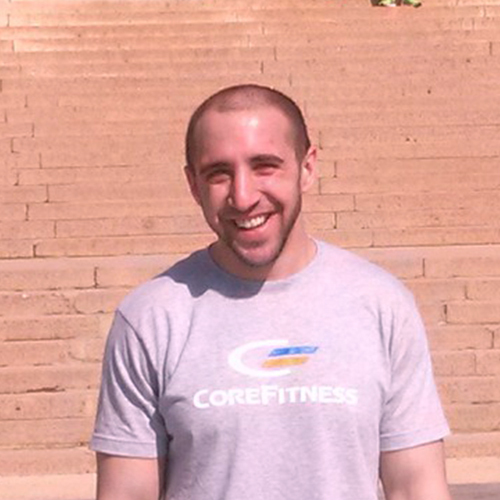 He has been training individual clients and leading group fitness class with CoreFitness for over 5 years. Jonathan specializes in body weight exercises and high intensity compound movements. He believes that having a goal in mind is a great way to motivate his clients to work their best. Jonathan’s modest demeanor enables clients of all fitness levels to feel comfortable training with him while he pushes them to achieve their goals. Jonathan’s favorite strength building exercise is the push up. He will readily demonstrates its effectiveness by his incredible human flag pole stunt or his push up and jump technique. He constantly strives to challenge and improve himself in order to lead by example for his clients. Jonathan’s energy and excitement for fitness is evident in his teaching style. He submerges himself into every class and takes its participants on a journey. He combined his love of history and passion for exercise by creating the Spartacus workout class series, now a favorite among CoreFitness participants. His workouts are effective and ever evolving. It is Jonathan’s easy spirit paired with his work ethic and physical intensity that makes him a leader. His skills and experience help him enable his clients to take their work out to the next level. Jonathan is a rare treasure within the fitness community.